Not all keychains are created equal, you can be sure of that. However, some are more equal than others, if you get what I mean. If you are sick and tired of those keychains purchased from your holidays as cheap souvenirs at the end of the trip when there is not much money left, and you remembered that your cousin twice removed along with his mom has been hankering after you to get them something, why not give them your keychain? You can always replace it with the cool Citrus Lights, which happen to be squishy light up keychains. 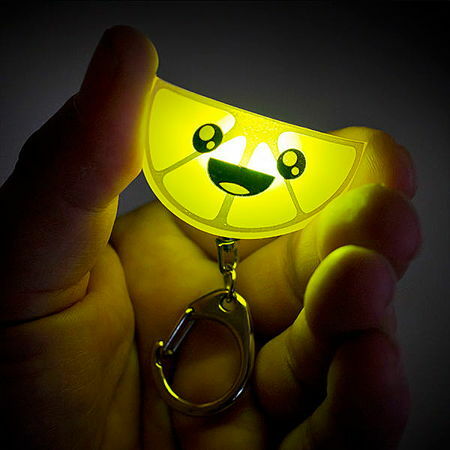 The keychain light resembles that of a slice of citrus fruit, where you can pick from lemon, lime, orange, or the No Scurvy Plz Set that will obviously hold all three. I would be wary of these in the presence of children though, since even as an adult, it does look tempting to me to give it a bite.